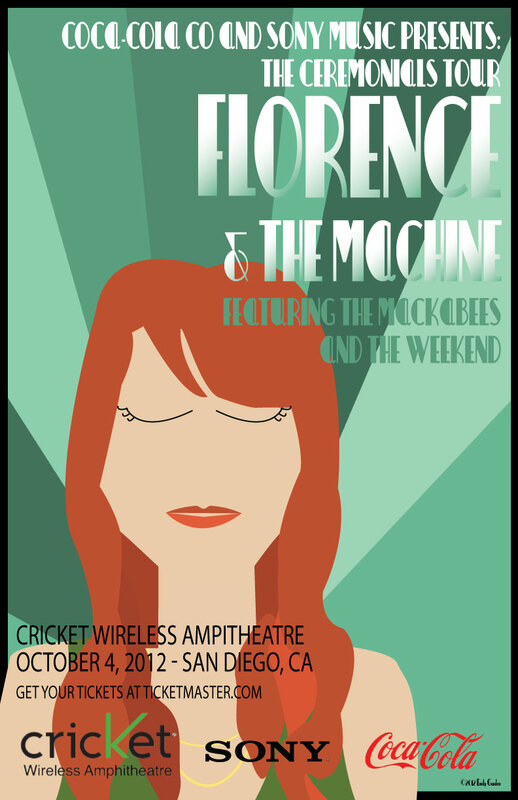 I chose an art deco theme for my poster because the genre was created out of opposition to art nouveau, a genre I thought would fit Florence and the Machine’s music perfectly. I felt like it would’ve been too easy to create an art nouveau poster around Florence because she often comes off as one of the flow-y clothed and free spirited women in some of the art nouveau artworks like I had seen when I was doing my initial research. I couldn’t find a particular artist that I wanted to emulate but I found a poster that I really liked that I knew was considered to be art deco. I have included a copy of that design below. The link to my original research is found below as well. The newest technique that I had used to create my poster that I didn’t know before was the pen tool which I used to create Florence, from her face and hair down to her necklace and dress. Link to original blog re: genre choice/research here. You’re good at this and it really shows here! I especially like her closed eyes that passes the emphasis back to the event title. and the way she eclipses the frame. Some pesky, ugly secondary sponsorship icons are missing, even though it is referenced. Really nice work—don’t stop doing it!